We were nearing the end of our amazing adventure on the Pamir Highway and had planned our trip perfectly to coincide with the cross-border market with Afghanistan at the town of Ishkashim on Saturday. We left Yamchun on a Friday and made our way towards Ishkashim. The drive was still beautiful as ever with the Wakhan River rushing beside us, mountains towering over us and green trees dotting the landscape. 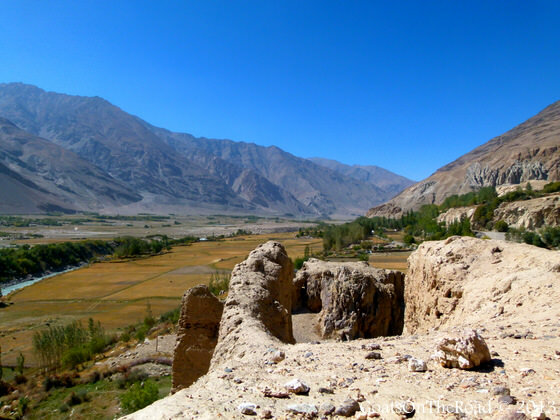 On our way to Ishkashim, we visited the Khaakha Fort, built in the 3rd century B.C. Even though the fort is armed by Tajik guards, we were still able to wander around and take photos. Arriving in Ishkashim we all felt mixed feelings of excitement and melancholy. We were happy to be in a proper village with shops and were looking forward to the cross-border market the next morning, but on the other hand, we all knew our journey was almost finished. We checked into our guesthouse and wandered around town. There was some sort of festival going on in the city and girls were decked out in brightly coloured, beautiful traditional clothing. We watched the performance they were putting on at their school before returning to the guesthouse, and were pleasantly surprised to see other backpackers had checked in! Up until this point, we had hardly seen anyone on our journey. So, we all figured we should have some beers together. There were us 2 Canadians, Jess from Germany, Jason from England, and the newcomers were from Australia, Switzerland, Spain and Hong Kong. It was going to be a good night. 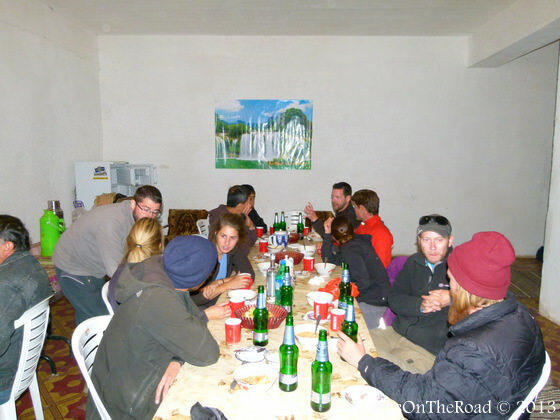 We all drank the Russian brew, Baltika, shared travel stories and information on the highway and called it a night at midnight. Around 5:00am the windows to our room were rattling and banging like crazy. I freaked out, shook Nick out of his deep slumber and announced: “someone’s breaking in!” …but then I realized that the bed was also shaking. The cows, chickens, horses and dogs were going crazy outside and there was this deep rumbling sound. No one was breaking in, it was an Earthquake! Not one, but two in a row. Everyone came out of their rooms, half asleep, half drunk, but all fully wondering what was going on. That was the first proper earthquake we’ve ever felt. After an eventful night we awoke around 10:00 to get ready for the market! This bustling market happens every Saturday. The bridge between Afghanistan and Tajikistan is opened up and people on the Tajik side are able to cross the river to the Afghan side. Passports are taken by the police, it’s heavily guarded and everyone is there to sell their wares. We were a bit early and were able to see the men from Afghanistan setting up everything. They came pouring through their border crossing with wooden carts filled with clothing, housewares, carpets, fabrics, you name it, they had it. 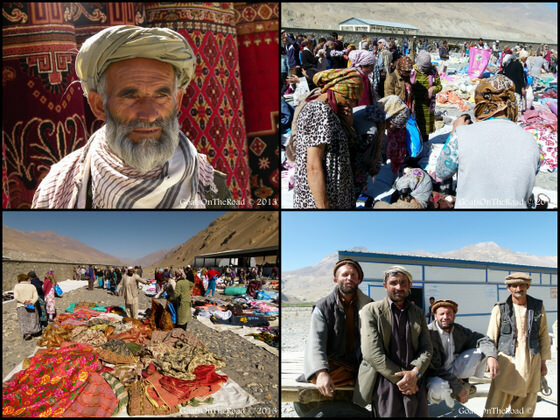 Although the women of Afghanistan don’t attend this market, it was amazing to see the local men in their traditional clothing, scarves and hats. We wandered around, shopped, bargained, mingled and had a great time. 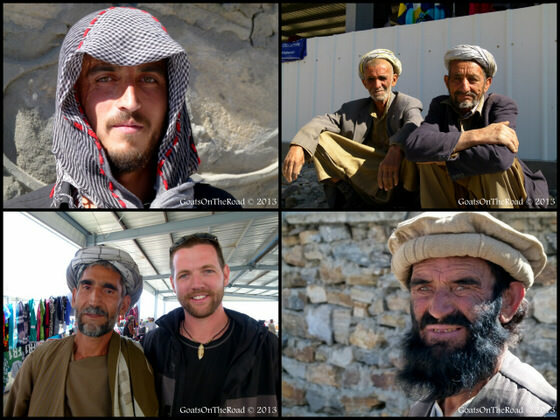 Since we weren’t able to go to Afghanistan, it was nice to still be able to meet the people…who were extremely friendly and curious of us. From the market, we all piled into the vehicle and made our way to our final destination of this road trip, the city of Khorog. But first, we stopped at one more hot spring! We enjoyed our last soak of the trip and continued on. After being in the mountains for so long and seeing villages of only a few hundred people, Khorog (population 27,000) seemed massive. 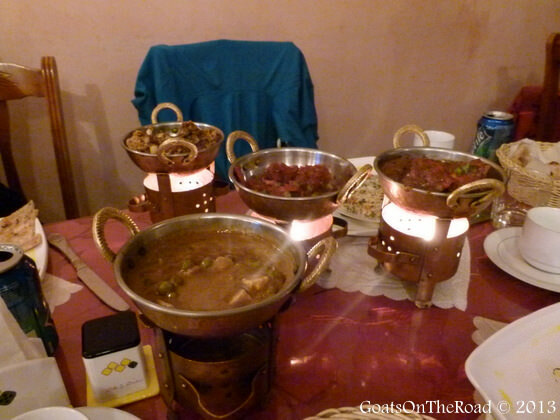 We checked in to our guesthouse and decided to go out for some celebratory Indian food as one final hurrah together. 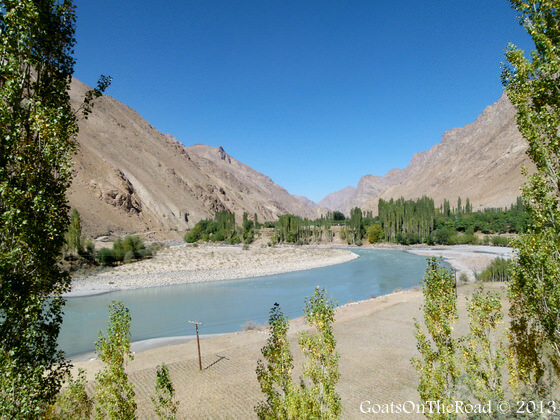 Travelling the Pamir Highway was such a memorable experience. We’re so fortunate to have had such a professional driver and great friends to enjoy the ride with. The sites we saw, the people we met and the mountains we drove through were some of the best we’ve ever encountered. This journey will remain in our hearts and in our minds forever. 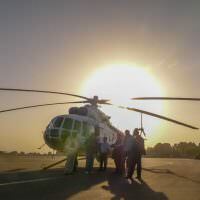 The next day we all made our way down to the “airport” to try to get on a helicopter flight to Dushanbe. Stay tuned to find out what happened next…trust me, you won’t want to miss it! Check Out Pt.3 Of Our 4 Part Pamir Video Series! 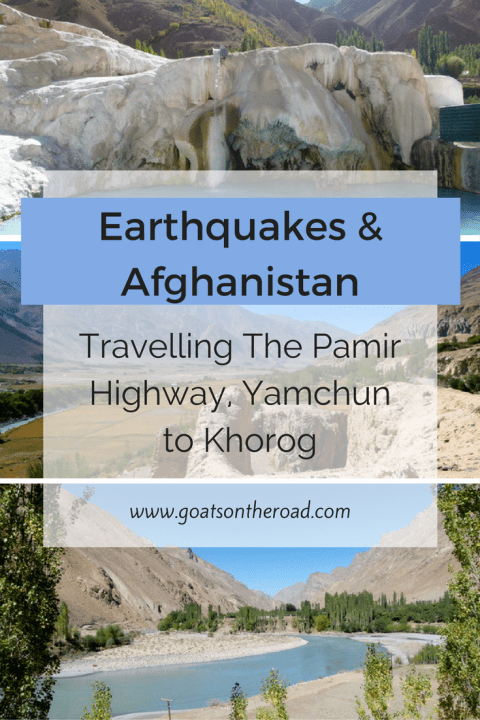 What do you think of our adventure on the Pamir Highway?! After seeing all of our articles, think it’s somewhere you would like to go? Leave a comment below! Earthquakes! They’re fun when buildings don’t fall down and no one dies. When we were renting an apartment in Arequipa, southern Peru recently, we experienced an earthquake every week. Just a little wobble really, but it was a first for me. This journey looks so amazing guys; looking forward to reading about the helicopter ride! No way! One every week? That’s crazy. Glad to hear they weren’t big enough to cause any damage to you or the city! Earthquakes are the weirdest feeling. 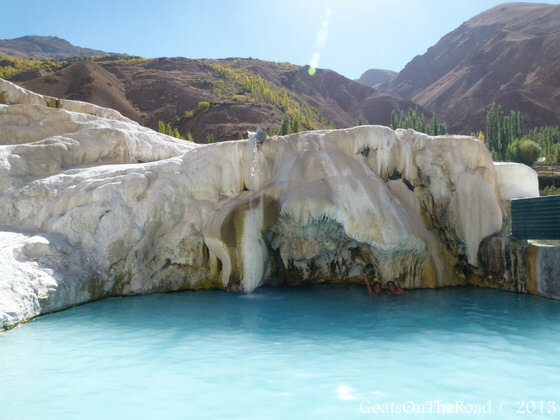 I’ve been starting to plan a trip like yours through Tajikistan and Kyrgyzstan (but in the reverse direction), and have just binged on all your content about it! Thanks for the thoughtful writeups on this lesser known part of the world! Hi Nick! Honestly, do bring some Clif Bars…seriously. Even though we eat meat, we often found it wasn’t done well, or it was “off”. We basically lived off of instant noodles, instant potatoes, eggs, rice, bread and peanut butter, Snickers bars, etc! First of all, this was a great story to read. I was laughing when I read about 18-years old driver and that guy who tried to get free ride with you. I am woundering how much did this trip cost. I am confused because you did write about one agency and then you started to talk about another (MATT I think). So can you, please, tell me the price for car+driver, food, sleep, etc. Can anyone provide any information on the current situation of this market? Assuming it may not be as safe as as when the was written. But keeping my fingers crossed for it to still be ok.